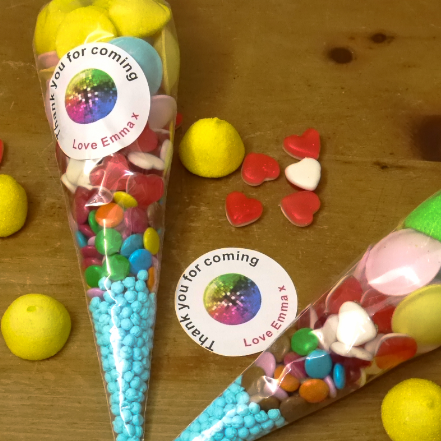 Looking for a sweetie gift to give your guests that will be really memorable? 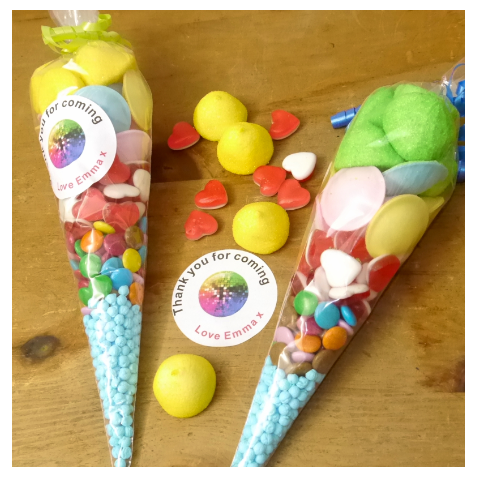 With our personalised party cones, you choose the contents, colour scheme, and message all at the click of a button. These cones are full to bursting. 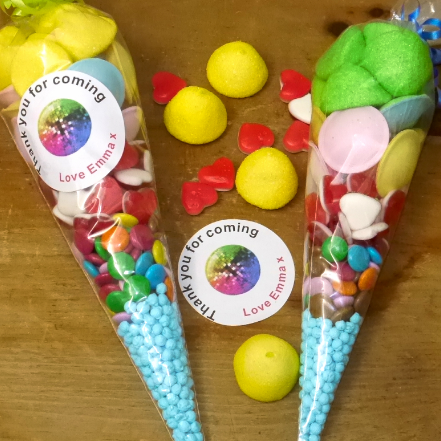 They hold between 200g to 300g of sweets in each (depending on choices made), and all are at the same set price of £2.75 each – including personalised message and ribbons. Let us know the wording you would like. For example: ” Thanks for coming, love from Brad x “, and if you’d like a picture label, the theme you would like ie ” Were having a 10th trampolining party ” and we can select an image that makes the cones unique to your special event. And don’t forget that if your order is over £25.00 and you live in an ‘AL’ or ‘EN’ postcode, then delivery is free! Simply pop your address in at the checkout and select the Free Delivery option! Check out some other party bag options here. Please advise us of any allergy/dietary requirements at the time of ordering. Can’t see what you want, or have other questions? Just contact us for more information.